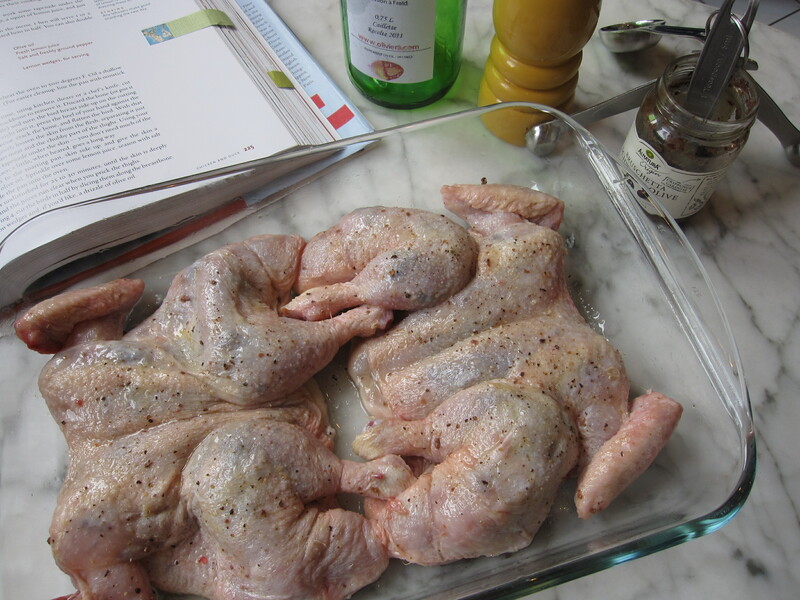 Some recipes are more about technique than ingredients and this week’s French Fridays with Dorie recipe, Olive Oil Cornish Hens, was a prime example. The list of ingredients was short and, aside from the hens themselves, consisted of basic pantry staples. Brilliant right? I will absolutely be using this technique again. Paired with pumpkin casserole and a mixed green salad, Dorie’s recipe made for a simple yet tasty meal. Edited to add the Pumpkin Casserole recipe. The original recipe came from Williams Sonoma’s New Healthy Kitchen book. This is my slightly tweaked version. Preheat oven to 350 F (180 C) and grease a gratin or other 2 quart baking dish. Coat pumpkin wedges lightly with olive oil and place on a baking sheet. Bake until tender, about 1 to 1.5 hours. Remove from oven, remove and discard the skins, and mash the flesh in a bowl with the nutmeg, creme fraiche, and salt-n-pepper to taste. Spread the pumpkin mixture in your prepared gratin dish. Melt the butter in a frying pan over medium heat, add the bread crumbs and stir for about 2 minutes or until golden brown. Sprinkle bread crumbs, rosemary, and cheeses over the pumpkin. Bake until slightly golden on top and bubbling at the edges about 20 minutes. This entry was posted in french fridays with dorie and tagged Around my French Table, main course, poultry, technique. Bookmark the permalink. I am in love with the idea of a roast chicken dinner in under an hour! Will definitely be doing this again. Love your pumpkin casserole! You’re right…I didn’t really think about this recipe being all about the technique, and I got hung up on the fact that the tapenade didn’t give it much flavor. 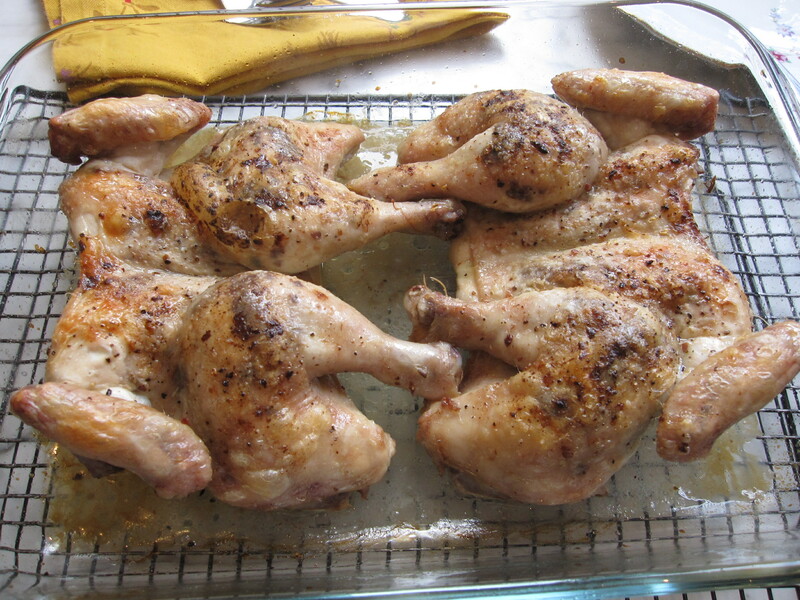 There is much to be said for having roast chicken ready in 30 min, regardless of seasoning. I’m also REALLY excited about the recipes this month, which is good because I was not overly excited about last month’s recipes. Not that they were bad, but this month’s batch is just so different from what I prepare on a regular basis and I am interested to see how it all turns out. The pumpkin casserole was a new recipe for me (from one of the books which is currently being testing to see if it has earned it’s space on my bookshelf) and the actual name of the recipe is pumpkin gratin with golden breadcrumbs. As you can see it is absolutely not a gratin and I was a little annoyed with the recipe at first. But once I changed the name in my mind to pumpkin casserole, it was actually quite tasty. First you roast the pumpkin in the oven until it’s soft, then you mash it up with some cream and spices, then bake it topped with some cheesy breadcrumbs for a bit longer, and done. If you want to try it I can email the recipe to you. Yep, pretty much the best part! I loved getting roasted chicken on the table in much less than an hour. Roasting a whole chicken is always a weekend effort, so this is a great alternative. The pumpkin casserole sounds awesome. Can you email me the recipe? I ended up posting it instead since you were not the only one to ask. Enjoy! Love your photos, Rosa. I will definitely use this technique again as well and can’t believe I have never used it before. Your hens browned beautifully and I hope you post your pumpkin casserole recipe. It sounds delicious. I agree, I had heard of this method before and had even heard that it produced really tasty chicken, but it always sounded a little too complicated somehow. But it was not complicated at all! I’m so happy that I joined this group, it is really expanding my cooking resume. As much as I don’t like the “Spatchcocking” process, I think I am a little infatuated with the word. It’s kind of fun to say. Everything looks great! Especially that pumpkin casserole. Love your pumpkin casserole idea–I made roasted sweet potatoes, which were perfect (except for being a little burned). Agreed, I will definitely be using this technique again, though probably not with the tapenade. I’m thinking garlic butter under the skin next time or a nice compound herb butter. Thanks for sharing the pumpkin casserole – it looks divine and very healthy too. I agree with you, YouTube has definitely changed the way we tackle intimidating things (from spatchcocking to raising orphan kittens). Your chicken looks great! And I definitely want to try the pumpkin gratin recipe, too. Thanks for sharing that one! Rose, I’m doing a Pumpkin Dinner Roundup this week, and I’d love to include the gratin recipe. Is it OK if I link to this post? A bunch of us are making pumpkin recipes and posting them on Sunday (Oct 9). A few days later, I’ll do a roundup of everyone’s posts. We could use another side dish, and yours looks perfect. If you want to join in the fun, shoot me an e-mail at phyl(dot)law(at)gmail(dot)com. Of course, feel free to include this recipe. Hopefully I am not responding too late for you, I think your request came in yesterday after I had logged off for the day. I’ll definitely check out your pumpkin roundup since I’m always looking for tasty fall recipes. I’ll definitely be trying the pumpkin casserole. I can’t wait until the weather gets cooler, and then these recipes will be perfect for us! a chicken” before I realized where I was posting. You dish looks fantastic. Thank you so much for the pumpkin casserole recipe. Nice and colorful. Your meal looks terrific! 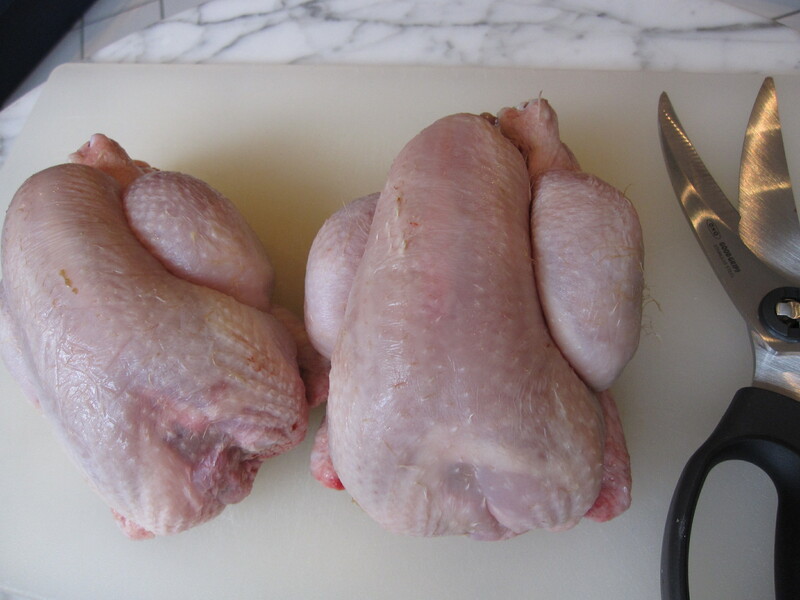 Your flatten hens look cute exactly like a toad 🙂 I did mine the same way as taught by Dorie and the olive tapenade was great for the chicken 🙂 I love it ! yes! I love spatchcocking! I imagine you can do it for any bird! It would be fun to try it with a ten pound turkey during the year before/after Thanksgiving to see how it works out and rub stuffing under the skin, I bet it would be tasty and cook for a lot less time! 😉 … Love your before and after pictures! I always enjoy reading your blog! 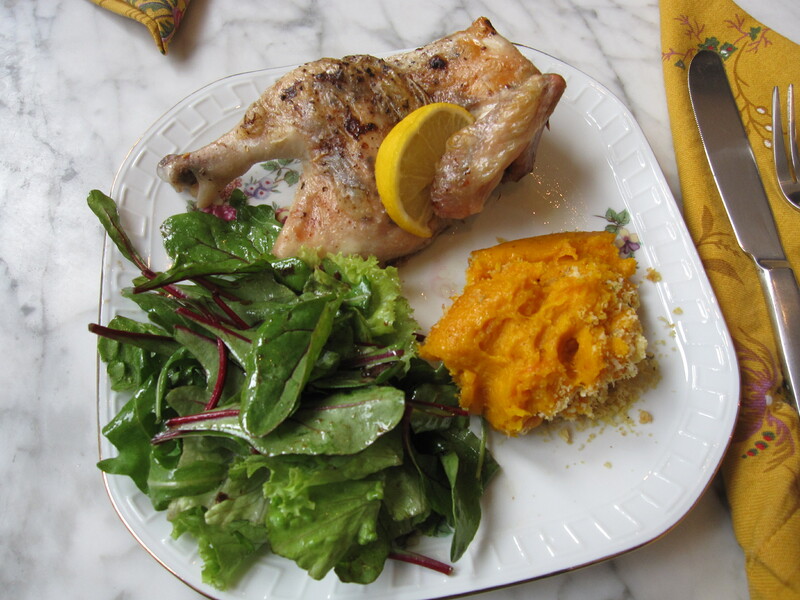 Your hens look perfect, and the plate is so pretty and colorful with the pumpkin casserole and the salad. Your hens look perfect…I actually made this while I was kid sitting for my grands last week but couldn’t get it posted. I hope to do that this week. So glad you posted the pumpkin casserole recipe…sounds so delicious would love to give it a try! I love that spatchcocking video, too! It’s so helpful to see things done, even when the written instructions are as thorough as Dorie’s. Thanks for sharing the pumpkin casserole recipe – it sounds really good. Your birds look perfect!